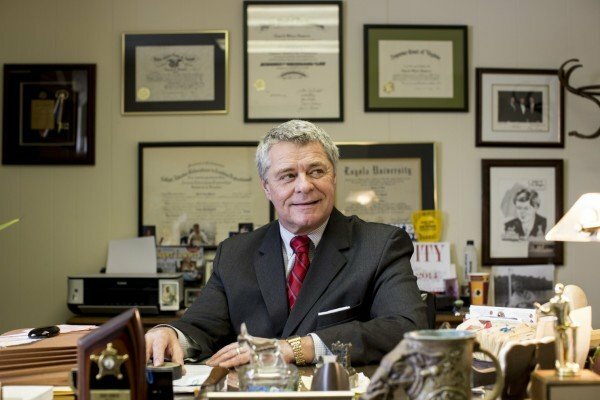 Roanoke Mayor David Bowers has come under criticism in Virginia after he appeared to endorse the internment of Japanese Americans during World War II. In a letter, Mayor David Bowers wrote that Syrian refugees should not be resettled in his city, citing security concerns. To highlight the point, David Bowers, a Democrat, compared the concern over the refugees to the 1940s internment of Japanese Americans. The internment camps – now considered illegal – are widely considered to be an embarrassing period in US history. “I’m reminded that President Franklin D. Roosevelt felt compelled to sequester Japanese foreign nationals after the bombing of Pearl Harbor and it appears that threat of harm to America from [ISIS] now is just as real and serious as that from our enemies then,” David Bowers wrote. More than 30 US governors have said they do not want Syria refugees resettled in their states after recent attacks in Paris tied to ISIS killed 129 people. Although the governors do not have the legal authority to do so, they can complicate the resettlement process. President Barack Obama called their response “hysterical”. Virginia Republicans sought to distance themselves from David Bowers’ remarks. “Comparing the prudent step of pausing to evaluate a vetting processes to the unconstitutional internment of American citizens proves that Democrats simply don’t understand national security,” John Whitbeck, the chairman of the Virginia Republican Party, said in a statement. The letter drew also ridicule on social media with celebrities condemning David Bowers. “The internment [not a “sequester”] was not of Japanese “foreign nationals,” but of Japanese Americans, two-thirds of whom were US citizens,” George Takei wrote.